Did you know we have a VIP Suite for our kitty campers? 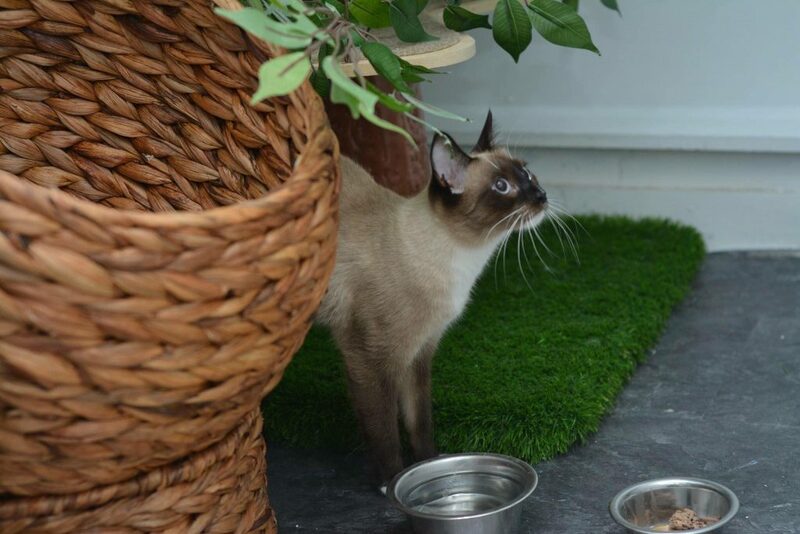 It’s a spacious room featuring comfy beds, chairs, scratching posts, greenery, toys and a window overlooking the rest of our cattery. Interviewer: Hi Odin and Freya! 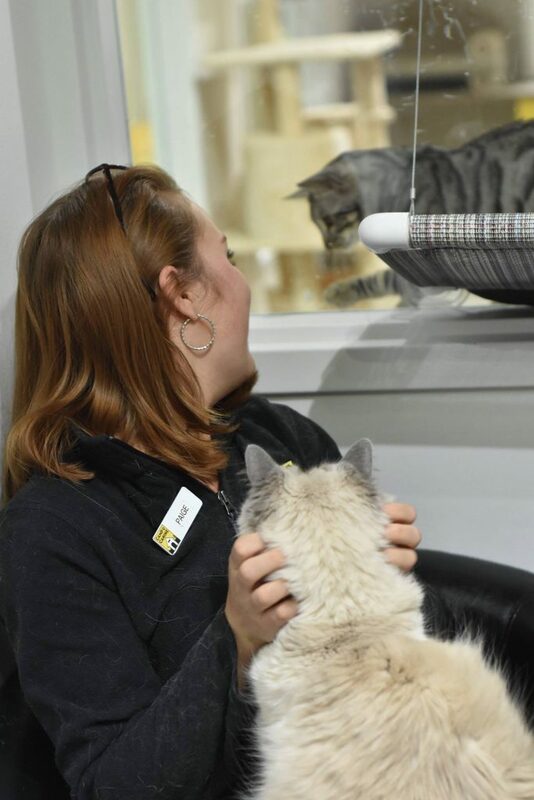 You were the first pair of sibling kitties to stay in our VIP Suite; what was your favorite part of that experience? Odin: Well, like you said, we come in a pair, so staying in the VIP Suite gave us room to spread out. I hung out in the condo, while Freya climbed the tree. Or I stretched out on the rug for an afternoon nap while Freya annoyed me with the stretching post. Freya: It’s totally private, too. The Camp Counselors come in whenever we want attention. They feed us, clean up after us and play with us; but other than that, we’re totally on our own and I can hog all of the toys to myself. Oden and Freya hiding in the foliage. Interviewer: Martin, does knowing you were our very first VIP guest make you feel special? Martin: Well, I already know I’m special. I’m 20 years old, after all. So, really, it just assured me that Camp Feline knows how to treat its elders. Interviewer: What was your favorite part of the VIP experience? Martin: There are so many places to sleep! There’s a lounge chair, a basket, shrubbery I can lay under and a condo I can climb into if I want to sleep in a dark, cozy space. There’s even a shag rug to lay on! A plethora of comfy places, if you ask me. Martin getting ready for a snooze. Interviewer: Yuki, tell us your favorite part about staying in Camp Feline’s VIP Suite! Yuki: Sure, the VIP Suite is great for elders like Martin, but I’m a playa’! It’s perfect for playing – so many scratching posts and toys. It took me days to get through all of them! And the leaves on the shrubs are perfect for boxing at. There was also a ton of space for running around and getting my energy out. My parents booked me a playtime every day because they know how much I love to play with humans, so the counselors would come in to spend one-on-one time with me. 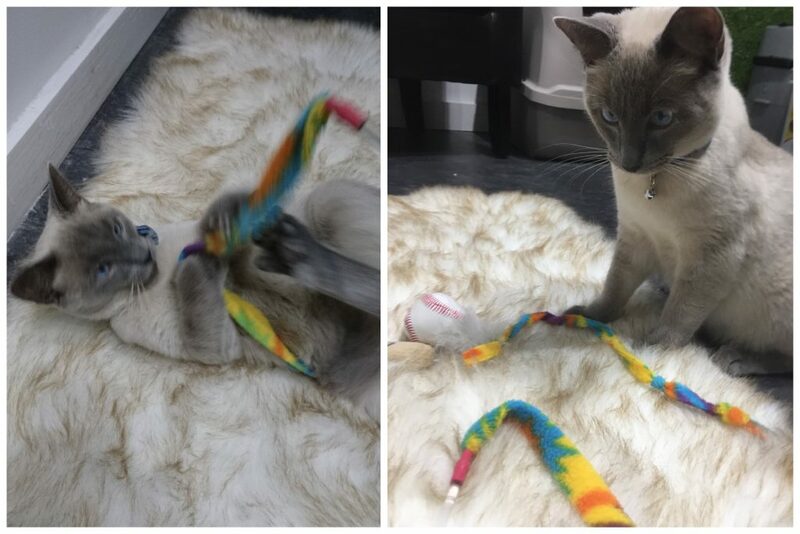 Even when them in the room, I could still dart from corner to corner and swat at their legs while they sit on the rug with their feather toys! Interviewer: Casper, we’ve heard so many perspectives, but you are our most recent VIP; what was your favorite part about staying with us? Casper: I’m a VIP, and I know it. And I want everyone else to know it. My favorite part of the room is the overlook where I can gaze out of my VIP Suite into the rest of the cattery. My counselors called it taunting, I called it ruling my subjects. Plus, the large window adds to the spaciousness of the room and provides us VIPs with some sweet scenery! Would you like your kitty to experience Camp Feline the way these VIPs do? Email info@nycampcanine.com or call (212)787-3647 to book today! If our VIP Suite is booked, our kitties stay in private condos that are made up of 2 floors and 4 cubbies. We let each camper out, one at a time, to explore the cattery on their own during the day. 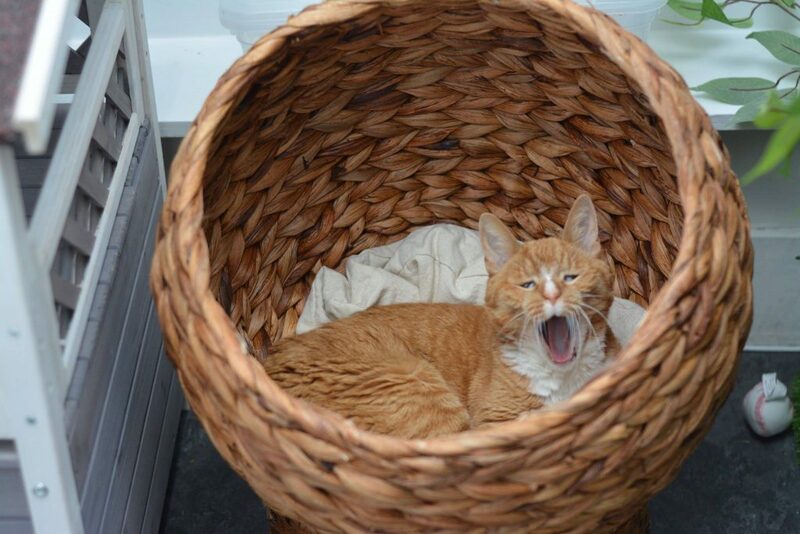 Our cattery is furnished just like our VIP Suite is: with scratching posts, toys, beds and hammocks for them to enjoy. Consider treating your cat to a Waterless Spa Day at the end of their stay. We use a foam-based shampoo that, when combed through, will both de-shed and remove dirt from your cat’s coat. It’s totally safe, and they can begin licking themselves again immediately after. The best part is its waterless feature: you go home with a clean kitty, and they don’t have to endure a traditional bath, which can often be hard on them. If you’d like to continue the Spa Day at home, pick up the shampoo in our Pawp-Up Shop! And, of course, each kitty camper is given the option of adding playtimes. If your cat loves human attention, consider booking a session of 15 or 30 minute one-on-one play. 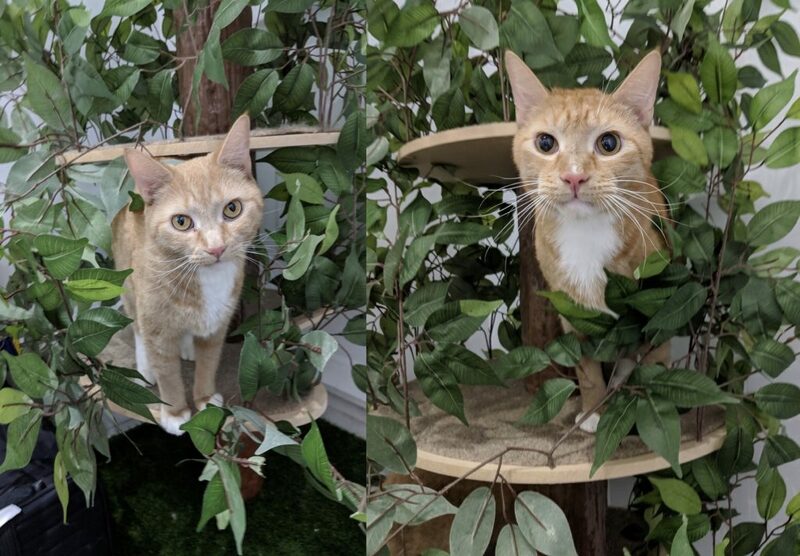 And during the month of April 2019, reference this blogpost to take part in our BOGO Cat Play sale!